Do I need nonlinear geometry? Will the structure deform much? It seems so trivial, right? But the truth is such questions are always the hardest. I mean – how many mm of deflection will you count as “much”? I could write that this is relative to the problem and simply end here… but let’s tackle this a bit! First of all how to know how the structure will deform? In many cases, you will just know! After all only the first few analysis will be your “first analysis”. Later you will be able to partially rely on previous experiences. After some time you will have a “gut feeling” telling you if the deformations will be high / low / “tricky”. If you can find any code requirements for your piece (or something similar) this is a good guidance. If the deformations of your model are smaller than the allowed this may (but not necessairly do) mean that deformations are small. Try to do an educated guess. If the deflection of the element is smaller than it’s length divided by 500 to 1000 (depending if you are an optimist or pessimist I guess) you should be fine. If you still don’t know… assume that deformations are high! Also, don’t be too crazy over this question. If the deformations are huge, the impact of nonlinear geometry will be very important. But the smaller deformations are, the smaller the impact of nonlinear geometry is (in this sense). So if you miss the call by a close margin and you will assume small deformations… the impact of nonlinear geometry will be most likely small. This means you will most likely get away with it! Just don’t be too cocky! It is better to consider nonlinear geometry that does nothing, that to ignore it when it is important! If you could ignore geometrical nonlinearity but you won’t, you will basically get the same outcomes as from linear analysis. So in the worst case scenario, you will waste some computing time. Congratulations! You already know something! Basically, the above means, that you need to use the nonlinear geometry in your analysis. Will the strains be large? Think about it this way: if the model deforms, but single elements remain more or less of the same shape this is “small strain”. If the elements themselves deform this is a “large strain”. So even if you are not sure, after the analysis you can see that in the outcomes. Most analysis I encounter are small strains, but this may not be the rule in your industry. Computing “large strains” usually takes more time… so if you don’t have to, don’t use it! If you have models that will greatly deform locally (like metal forming, rubber seals fitting new geometry etc.) large strains are a good option. As with everything – if you are unsure use it… in the worst case you will waste some computing time! The structure deforms much, and you picked large/small strains! Will the loads follow deformations of the structure? 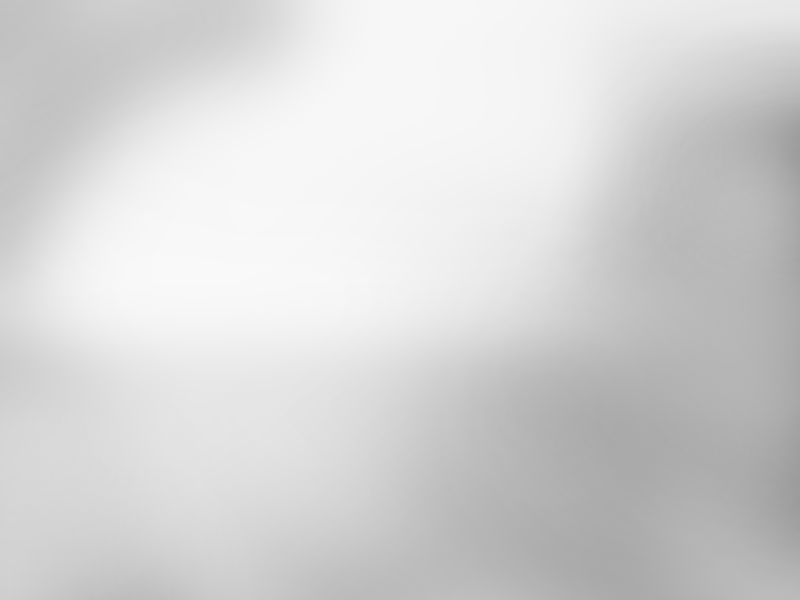 This one is simple. You should know the question simply by understanding the nature of your problem. There is not a lot you can do to “verify” this assumption. It simply depends on the “type and behavior” of the load in real life. Gravity: load won’t follow the deformations. Gravity works always downward… it won’t change simply because the beam have bended! Pressure: load will follow the deformations. Pressure always acts normal to the surface. When surface deforms, pressure changes direction. This works both for liquid pressure as for gas pressure. Enforced deformations: This is tricky. It depends on how the deformations are enforced. On a guess, I would say that they won’t follow deformations of the structure (think about a hydraulic press) but I’m sure this can be the other way as well! 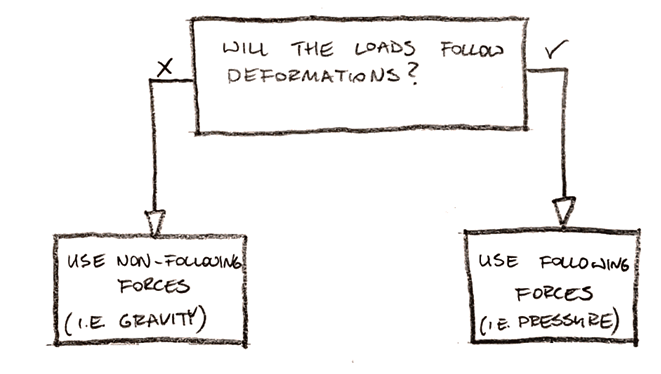 If the load will follow deformation, use “follower (or following) forces” in the analysis. When this doesn’t happen, don’t use “following forces” (this option does not have a “real name” it’s either “following forces” or “no following forces”). If the deformations are small this is of little consequence, but this is not this part of the Flow Chart – we will get there now! Is the model “thin” in at least one direction? Normally one could refer to a structure that is “thick” in all directions as to solid. But this can be confused with solid elements (like HEX or TET). And you can model shell and even beams with solid elements. To avoid confusion think about it this way: “can something buckle”? If you have a beam the cross section of it is at least 10 times smaller than the length (so it is “thin” in both in-plane directions). Shell is far thinner than it’s other directions (so it is also “thin”). Both those elements CAN buckle if under compression. 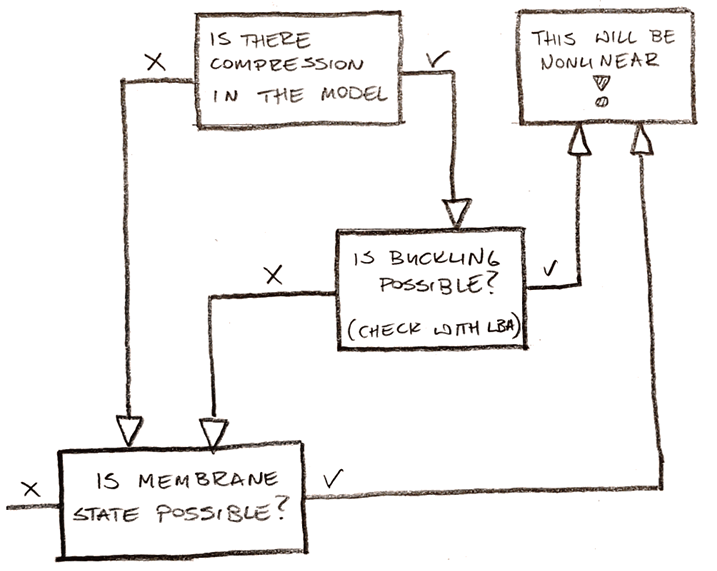 It doesn’t even matter if you have compression in your model or not… it’s only for classification! In contrast, a normal 6 sided dice is “thick”. Not a single direction of it is way thinner than the others. But if I would take a box (thin walls but “overall” shape is a cube) it has “thin” walls right? This is a bit tricky to describe, but at least the answer is more or less intuitive! We are searching here for 2 things – if something can buckle, and if something can “go membrane”. Deformations are small, nothing is “thin”! This is boring, so let’s be done with it. Congratulations – it seems you are loading a solid piece that won’t deform a lot and also won’t buckle or enter a “membrane” state. This means you can easily use linear geometry in your analysis! Deformations are small, something is “thin”! Is there compression in the model? Firstly, let’s think if you have some compression in the model. This does not have to be caused by “compressive load”. Bending also produces compression in part of the element (this counts as well). However, I would be worried about bending only if you “bend” the element against its “strong axis”. If you bend the plate out of its plane… it won’t lose stability regardless of how much you try! In other words, if there is compression or in-plane bending there is still hope for a nonlinear problem! Deformations are small, something is “thin”, there is compression! Nice! Now we are in the buckling zone! In general, it is wise to check if buckling (or lateral torsional buckling, and sometimes even buckling under shear) is possible. This can be achieved by Linear Buckling Analysis (LBA, but in all honesty “B” is for bifurcation not buckling in that name). If the outcome satisfies you, then great… if it doesn’t then it’s even better, as the problem just got nonlinear! As always all is nice “in words” but when LBA outcomes are “acceptable”? I have met so many people that claimed that if the critical multiplier is higher than “X” then all is fine… This is only true if “X” is very high I’m afraid, and only for certain problems! Truth is that critical multiplier varies, and value unacceptable in one model, can be easily accepted in another… There is no “golden rule” here. In a reasonably designed truss multiplier of 3 for the bracings is more or less fine. For a frame, the multiplier of around 10 may indicate you are fine (doesn’t have to and still buckling will reduce capacity BTW). In a shell I would never ignore nonlinear buckling analysis… well maybe around critical multiplier of 100 I would think about it. In general, if you are not sure… go with nonlinear buckling analysis. You simply can’t be wrong this way! Also, don’t forget about imperfections in buckling cases! Of course, if buckling is possible, large deformations will happen, so you should “consider” large strains and follower forces as well. 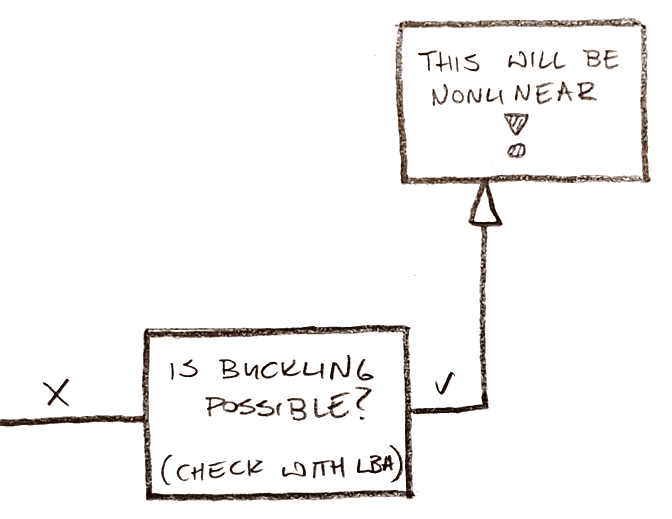 If you decided that buckling is possible, it’s just as if you would answer that deformations will be large in the flowchart… but with imperfections being more important! Deformations are small, something is “thin”, there is no compression! Don’t lose hope yet! There is still something that can be nonlinear. Remember the story about my favorite sweater when I explained how geometrical nonlinearity works? I used a string there to explain what a “membrane state” is. You see, when you deform something that is not rigid (“thin” in at least one direction), it can deform a lot. Then, instead of bending, you get tension in this element (more on this in my sweater post!). Professionally you can say that bending and tension are “coupled” in the model. This means, that something can go into “membrane state”, and this is a geometrically nonlinear problem! This is also our last resort! If you have a model where something is thin, but it is not loaded in such a way, that it can go into membrane state… you should do a linear analysis! Also, don’t worry! If something CAN enter membrane state, the linear analysis will show significant deformations, so you will most likely classify it as “large deformations” in the first questions. In such cases deformations in the nonlinear analysis will be smaller… this is called stress stiffening and is completely normal! 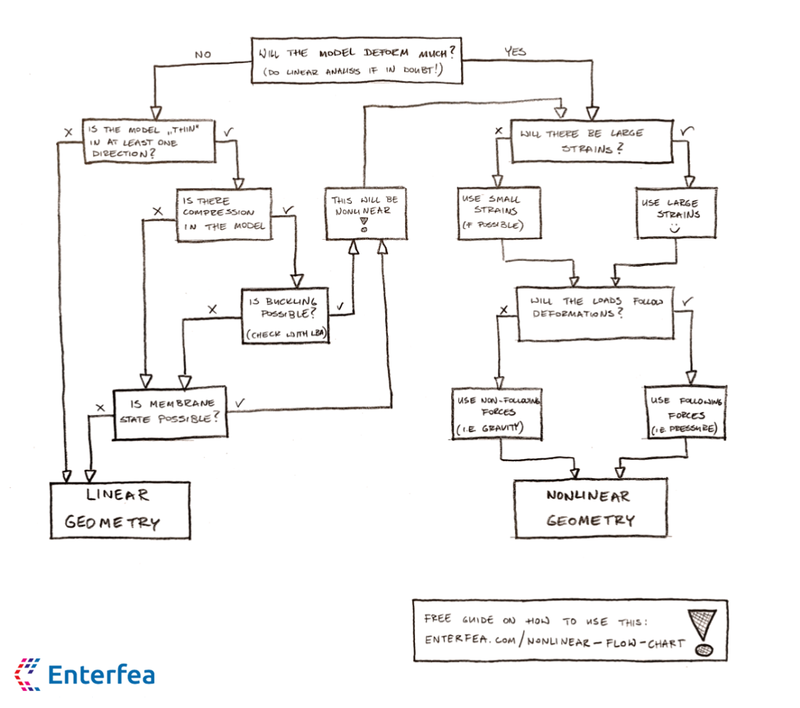 In this part of the #NonlinearFlowChart you have learned how to assess if the nonlinear geometry is required. Next, we will talk about other parts of the chart! It will be fun – trust me!